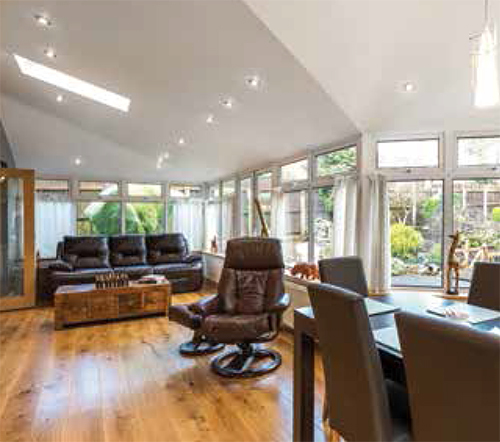 Bright, spacious and airy, your conservatory is a great addition to your home. But as the seasons roll by, changing temperatures can make it uncomfortable to be in – too hot in summer and too cold in the winter months. 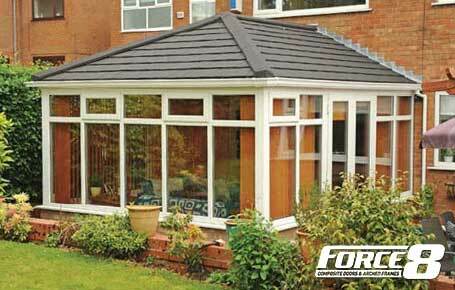 The Force 8 tiled roof is the perfect solution. Combining high-quality precision engineering with attractive styling inside and out, you’ll be adding valuable extra usable space to your home without the high cost of building an extension. 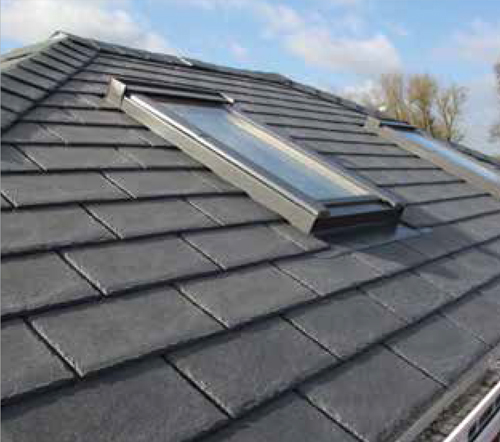 It all goes to make the Force 8 tiled roof the best value way to improve your lifestyle. 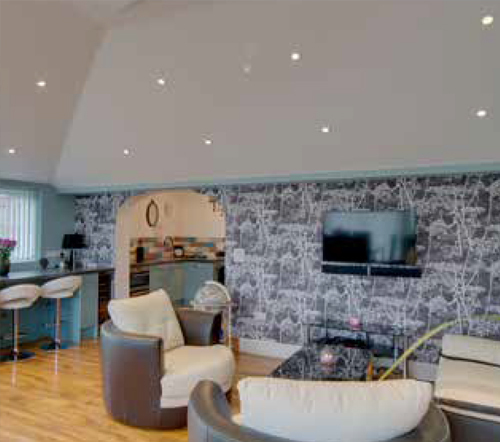 The internal surfaces of your Force 8 roof can be finished with a modern plasterboard or tongue-and-groove timber ceiling – creating the look and feel of a conventional home extension. If you want to maintain a light, bright and airy environment, then optional roof windows will flood your conservatory with natural light – without the harsh summer glare of traditional conservatories. 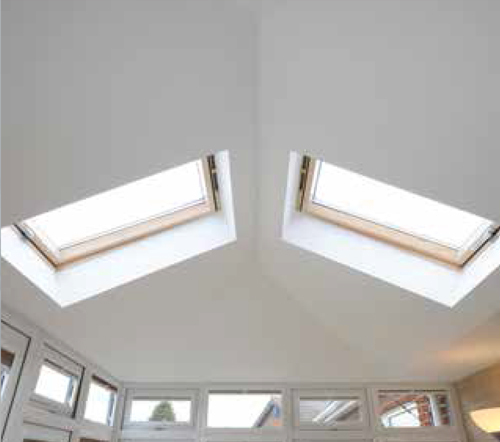 Our premium quality roof windows are available with a choice of features – just ask for more information. Featuring purpose-designed components including flush fitting rafters, new box gutters and a variable ring beam, the Force 8 roof brings your homeowners real confidence and peace of mind. They’ll know that they have chosen a premium quality product. One of the other main benefits of installing a solid roof is the savings on fuel bills, our solid roofs are fully insulated, so as we’ll as keeping the summer sun out, it also keeps the heat in during winter. 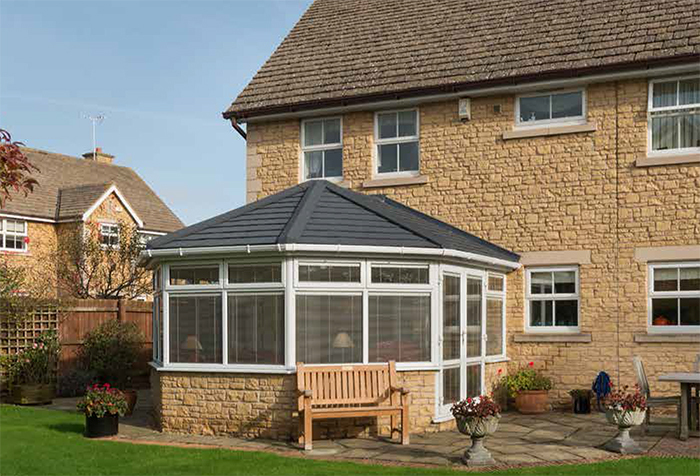 Solid conservatory roofs are compatible for all type of conservatories – whether that’ll be a p shaped design or a small lean to, Force 8 can design any roof to meet your conservatories needs. 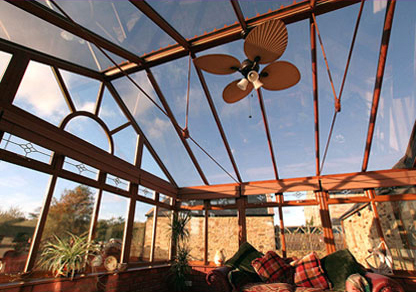 No matter the design of conservatory roof that you decided on, you can be sure that there is something for you. Depending on the size and shape of your existing conservatory and the style you choose, Force 8 can determine a price that is best for you. 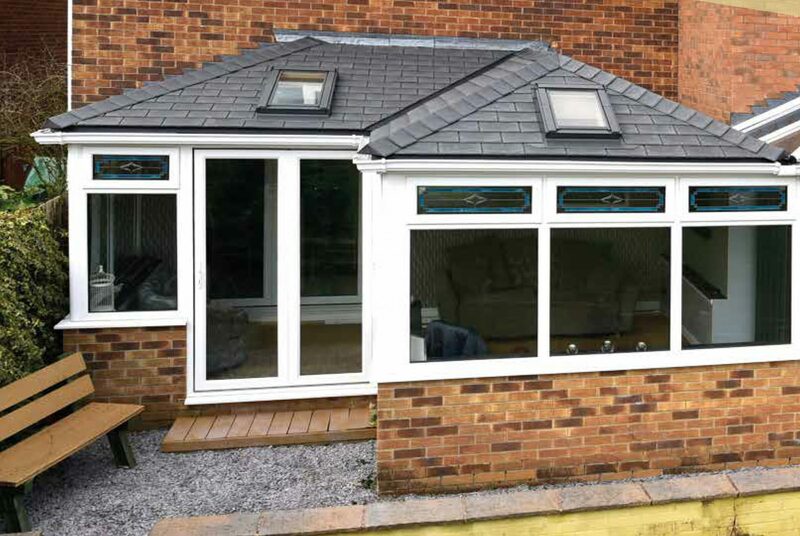 Our solid roof system will fit most existing conservatory configurations, for further information contact us and we can survey the your conservatory and give you a solution and a quote for the work. A glass conservatory roof is the perfect solution for your conservatory. Glass roofs are becoming more of a current sight on conservatories in the UK, giving an home an aesthetically pleasing finish. These glass roofs are supplied by Eurocell, offering a style for your conservatory roof which is toughened yet high-performance glass. The glass that is used will help to keep you and your conservatory cooler when the sun is shining and will provide you with better thermal insulation when used with the optimal internal pane glazing. 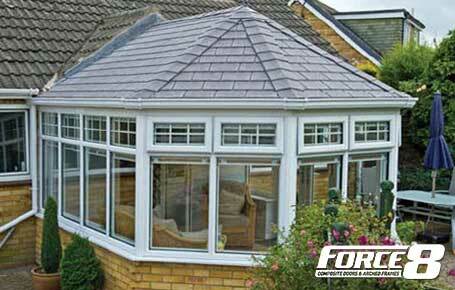 Furthering this, glass roofs help to retain warmth in your conservatory during winter months, cutting down your energy bills. U values refer to the amount of heat transference across a structure. The lower the U value, the better the glass roof is at saving energy. Whenever you see new building regulations and amendments, the U Value that is required is lowered; requiring changes in building design to comply with new U Value regulations. G values refer to how much solar heat can be let through a part of building. A low G value is an indication that glass is letting through a low percentage of solar heat. To improve the g value of the glass, the outer glass pane will be coated with an IR reflecting surface which will reflect some of the radiant heat. This is due to reducing the cost of the cooling the property and to improve the indoor environment properties. Glass roofs are a revolutionary feature for your conservatory with a dual action and self-clean coating which is standard for the product. Self-cleaning properties are useful as the sun rays will break the dirt on the glass which will then be washed away by rain. Once the rain drops hit the glass surface, this will spread evenly and easily drain away any dirt. Glass roofs are sturdy and robust and are designed to withstand the worst of British weather including high winds and heavy snow. The overall structure of glass roofs is much stronger as they support the weight better and they will last much longer than other styles of roofs. 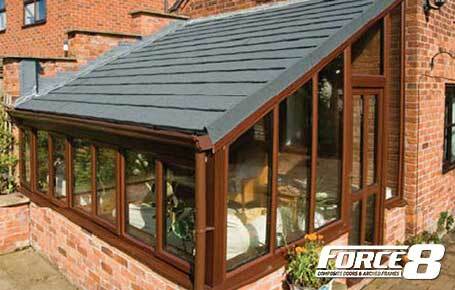 New conservatory roofs are a great option if your current roof is suffering from leaks, condensation or mould. Force 8’s new glazing technology allows the glass roofs to be more thermally efficient. Glass roofs are manufactured in such a way that they bring in large amounts of light but without any glares and reflection. Glass roofs are popular amongst homeowners. We can tailor your roof to meet your personal specification, expectations and budget whilst using the best materials, suppliers and products. 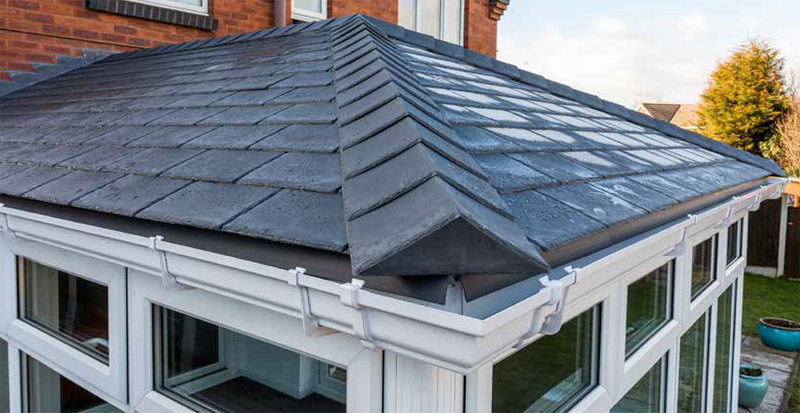 These products are cost effective guaranteeing that Force 8 is the most ideal company for to you to choose when replacing your conservatory roof. 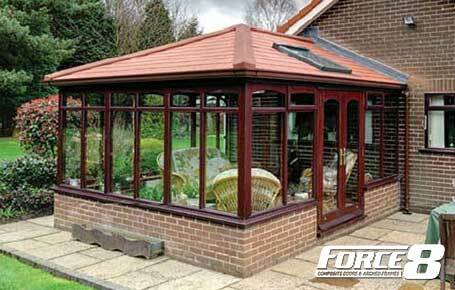 A glass roof can be added to any style of conservatory whether that is a lean to, P shaped or Edwardian. Glass roofs are a home improvement without the disruption, typically taking around three days to complete the installation.